Tomorrow the calendar year will close, and my balance related to music can only be positive; sure, something didn't went as I expected, but some great surprises came also. Well... sorry, I can't tell nothing more about this. Stay tuned, and see ya next year!!! 24/12/2005 - Merry SOULFUL Christmas!! At last the history archive of my performances is online; the data are still incomplete and I'm still refining the interface, but the whole is already working and accessible through the renewed calendar page. Tomorrow night at the Indian's Saloon the ticket will cost 10 Euro including a drink, or 15 including drink and pizza; I remind that the money will contribute to the fund raising for the Telethon foundation. Best wishes to Captain Stax, true living legend of the Italian "mod" scene: today it's his birthday!!! Next friday, OverTime live again (to raise funds for TeleThon) at the Indian's Saloon in Bresso (near Milano), followed by two other bands; it will probably be the last show based exclusively on our old repertoire, so don't miss it!! I'm still busy with the site changes; in case of problems (example: missing images), reload the pages! I'm doing some "underground changes" on this site; I also added a new song on the lyrics section. The listeners' chart of ModRadio UK has the BEST on its first position!!! The useless Links page has been removed, and I'm going to add a Leftovers page to be filled with every kind of stuff that didn't fit with other sections of the site. I moved some items in the navigation menu, modified many bands' pages, and created a new intro page about my experience with the group Caronte. I began the technical-aesthetical retouching of the site, as you can notice by opening the navigation menu on the left. I also started to plan an independent site for the Blue-Eyed Soul Team, that I hope to launch before year end. It was the 13th of April 2002 (!!!) 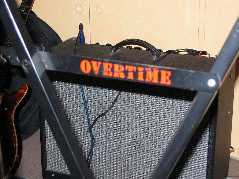 when OverTime had their last gig, excluding the benefit shows for TeleThon. And yesterday night at the "Pulentin Musica E Vin" in Milano the wait has been awarded by a winning night, with the crowd gradually more and more involved in singing and dancing, and the usual highly appreciated congratulations from perfect strangers (male and female... ;-) that confirmed the overpositive balance of the comeback for a band who has all the rights to be defined as historical, since its birth in November 1988 and having not changed its lineup since 1996. How can I describe what a wonderful show the Blue-Eyed Soul Team had in Modena yesterday night??? Be patient, we are just working on the band's official web site to be launched as soon as possible. Many "special" (i.e. with a string orchestra!!) dates by the Rainbow Singers around Italy are on schedule, but I'm collecting more info about them; as soon as they're confirmed, I will post them in the calendar page. The mighty OverTime will come back on stage next month! Look at the calendar page for more info. The three dates in France at the end of November for Mike Painter & The Family Shakers have been cancelled / postponed. Sigh! I did some small retouching on several bands pages, and added some new song lyrics. First concerts are coming: I updated the calendar. Noticed something new on the left-side menu? Have a look at the new Blue-Eyed Soul Team page (still under construction: I have to finish the translation...), which replaces the Love Revue one. Some additions to the bio page, and a minor update on the OverTime page as well. Yesterday night, the amazing concert of the World Chamber Choir with Voceversa Jazz Company at the Teatro Litta in Milano closed perfectly the experience of the vocal seminar of the two previous days; it will be impossible to forget such a chilling execution and the pleasant company of those brilliant guys and girls coming from around the world. The night at Radio Lupo Solitario has been recorded, and I will try to make it available here on the site. My next week will begin with a couple of interesting events. The second event is more simple: I'll come back to Radio Lupo Solitario as guest of DJ Henry for his usual show "Action!" to present the 5 demo songs of the ex-Love Revue, now renamed Blue-Eyed Soul Team. You may listen to the transmission via the web streaming of the radio station from 11 p.m. on Tuesday 13 September. More details about this demo and the band's new name will follow soon. ...And this year is gone as well, and I still don't know what to do when I'll grow up! Since next week everything will really start again: a two-days choral workshop, a night of rehearsals, a radio show with the presentation of the new demo CD... The related details will follow. Tonight I should meet some people, including two female friends-vocalists that I will hold tighter that the others: one lost his father a few days ago, the other is going to France for one year. Then we will smile back again, I promise. After a year of activity of the site, the balance is more than satisfying, also according to the statistics (see counter and link on the left); now a new chapter will open, with the news of my new "artistic year". Some anticipations? the ex-Love Revue presents a five-tracks demo and restarts with a new name! OverTime come back on track! There will be the startup of the project temporarily named "Perfect Pair"! The project of the contemporary Gospel choir (so far called "SatisFashion CGC") that stranded a few months ago will restart with new attributes and a flexible high-power lineup! ...and then there's Mike Painter, the Group Caronte, the Rainbow Singers, other ideas and proposals... all evolving stuff! Finally, the day after tomorrow is my birthday... and a few days ago somebody "gave" me twelve years less... I really can't complain! PS: the date in San Remo for the Family Shakers has been cancelled. As planned, yesterday night I came back from the holidays: one great week around Europe, touching beautiful cities like Prague, Bratislaw, Budapest and Vienna. I'm reallly tired but I had so much fun!! However, it was very bad to watch every night the TV news talking about the disasters of New Orleans, also because a few months ago I was planning to visit it just a few days before the tragedy, and now I won't ever had a chance to see that musical city as it was before. I really hope that the emergency will end soon. Back to music... I expect some interesting news very soon; stay tuned.